Nine Years After 9/11, Is Al-Qaeda's Threat Overrated? 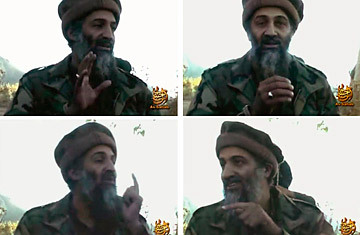 A combination of undated video stills shows Al Qaeda leader Osama bin Laden. Nine years after the 9/11 attacks, al-Qaeda's shadow still looms large in America's national conversation. President Barack Obama on Thursday warned that a grotesque Koran-burning prank planned by the pastor of a tiny Florida church would be a "recruitment bonanza for al-Qaeda." The putative threat of Osama bin Laden's little band of terrorists, believed to number no more than a couple of hundred, is also the prime reason offered in Washington for keeping close to 100,000 troops in Afghanistan at a huge cost in blood and treasure. "No challenge is more essential to our security than our fight against al-Qaeda," Obama said last week. "And because of our drawdown in Iraq, we are now able to apply the resources necessary to go on offense." GOP heavyweight Newt Gingrich disagrees, warning that the Administration lacks a "serious strategy in fighting terrorism" and is blind to its danger  echoing Senator John McCain's effort, in the final weeks of his doomed 2008 presidential campaign, to rally support by asking whether Barack Obama "is a man who has what it takes to protect America from Osama bin Laden." In U.S. politics, you downplay the "al-Qaeda threat" at your peril, as Senator John Kerry discovered in 2004, when he suggested during his ill-fated presidential campaign that terrorism could not be eliminated, but could be reduced to a "nuisance" level where it wasn't dominating Americans' lives. Al-Qaeda, he said, was essentially a diabolical criminal enterprise that should not be given the status of a geopolitical challenger on the order of Hitler or Stalin. Kerry's view did not convince voters, but it may well have been vindicated by events. Systematic police work and intelligence-driven military strikes have reduced the operational core of bin Laden's movement to a handful of desperate men hiding from U.S. drones in the wilds of Pashtunistan. They've failed to launch another attack on the U.S. mainland, and even the handful of devastating strikes in far off places  Bali, Madrid, London, Istanbul  that followed 9/11 have given way to the occasional, amateurish attempt by one or two people recruited via the Internet. More important, al-Qaeda's attacks failed miserably to achieve their main objective: to inspire a global bin Laden-led rebellion against U.S.-aligned regimes throughout the Muslim world. While the 9/11 attacks made bin Laden the focus of American fear and rage, his "global jihad" failed to either eclipse or enlist its more localized Islamist rivals. Hamas confined itself to striking Israeli targets, and to competing with Fatah for local political power at the ballot box and on the streets; Hizballah continued to lock horns with Israel on its northern border and to engage in the complexities of Lebanese politics; Iran actually helped the initial U.S. military campaign in Afghanistan, although it soon resumed its struggle with Washington and its allies for influence throughout the Middle East. Al-Qaeda may still figure in U.S. debate, but it no longer garners any attention in the Arab political conversation  prompting it to issue increasingly hysterical denunciations of Hamas, Hizballah and Iran. See pictures of President Bush in the Middle East.